Here are 12 stats you may not know from the Packers 31-23 win over the Bears (the stats all reflect regular season games unless otherwise noted). Behind 13-10 at half, the Packers defeated the Bears for only the second time when they were behind at half to the Bears in Chicago. The other time was in 1998 when the Pack was down by three at half to the Bears in Chicago and came back to win that game 16-13. 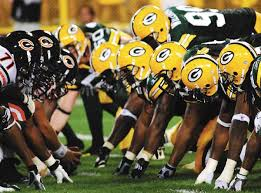 The Packers are 8-49 (.140) in the all-time series against the Bears when they are behind at halftime (home or away). Matt Forte became the 22nd runner to gain 100 yards rushing in a regular season game against the Packers since 2000. Forte has 141 yards on 24 carries. The Packers are 12-9-1 (.568) in these games. Forte became the 50th runner to gain 140-plus yards rushing against the Packers since 1960; Green Bay is 10-38-2 .220) in those games. The Packers did not have a turnover in the contest. They are now 53-6-1 (.892) since the turn of the century in games where they did not have a turnover. They are 14-0-1 in their last 15 games dating back to October 14, 2012. Clay Matthews had his sixth career interception in the game. The Packers are 6-0 in games when Matthews intercepts a pass. James Jones made a triumphant return in a Packers uniform with a pair of TD pass receptions. It was the sixth time in his career that he had two or more TD pass receptions in a game. The last was December 16, 2012 when he had three against the Bears. In fact, three of Jones six multi-TD games were against the Bears. The Packers have now won 10 straight games when they score 30 or more points in a regular season contest. The team is 34-3 (.919 winning percentage) in games when they score 30-plus in a game since 2010. They rank tied for second (with the Broncos) in the NFL since 2010 with 37 games with 30-plus points scored. The Patriots have scored 30-plus in 48 games since 2010. Eddie Lacy had 85 yards rushing on 19 carries. The Pack is 13-2-1 in games when Lacy gets 16 or more carries in a game; they are 11-3-1 when Lacy has 80 or more rushing yards in a game. The Green Bay defense surrendered 23 points to the Bears. Since 2010, the Packers are 41-9 (.820 winning percentage) if they hold opponents under 24 points in a season game. They have now won 23 of their last 25 when the “D” holds the opposition under 24 points. Aaron Rodgers had his 44th three-TD pass game of his career, and his sixth versus the Bears. The Pack is 37-7 (.841) in these games. His QB Rating was 140.5, the 11th time he has been over the 140.0 mark in a game (the Pack are 11-0 in those games). It was also the fourth time he was above 140.0 against the Bears. The 2015 season opener was the 68th time since 2000 that the Packers scored in every quarter in a game. They are 56-12 (.824) in these games, and have now won eight straight when they get on the board in each period. Rookie returner Ty Montgomery had 106 yards in return yardage in the game. He became the first rookie to have over 100 return yards in his first game with the packers since Randall Cobb did it in 2011. Winning the first game of the year has been a good omen for the Packers over the last 15 seasons. The Packers won their first game of the year in eight of those seasons, 2001, ‘02, ‘04, ‘07, ‘08, ‘09, ‘10, ’11. The Packers ended those season with a combined 89-39 record (.695 winning percentage). They also made the playoffs in seven of those eight seasons. In those seven seasons (2000, ’03, ’05, ’06, ’12, ’13, ’14) when they lost the first game of the season, the Packers were a combined 62-49-1 (.554 winning percentage) and made the playoffs in four of those seven years.